Hanuman: Famously known as The greatest Lord Rama devotee. Lord Hanuman was one of the key and important roles in Ramayana. Lord Anjaneya was the main hero in Ramayana who was there always with Rama and who protected Lord Rama, the king of Ayodhya and Lakshmana always. Ramayan Hanuman always loved to serve Rama and worship his god, Lord Rama. God Hanuman was the only warrior among all Vanaras who was capable to go to Lanka and to know about Sita Mata. Lord Hanuman was also known as Hindu monkey god throughout the world. People will worship Lord Hanuman as a symbol of braveness and courage. These are the different lord hanuman names. Do you know about the Hanuman life story!!!!! Let's discuss the Hanuman birth and Hanuman child story. Hanuman birthplace was Kishkindha. Hanuman was Vanara. Lord Hanuman born to Vanara couples. Mother of Hanuman was Anjani. Father of Hanuman was Kesari. Both Anjani and Kesari did not get children for a long time. Then they both prayed for Lord Shiva for a child. Lord Shiva then reincarnated himself as Hanuman and born as a child for both Anjani and Kesari. The child was born with the monkey face. 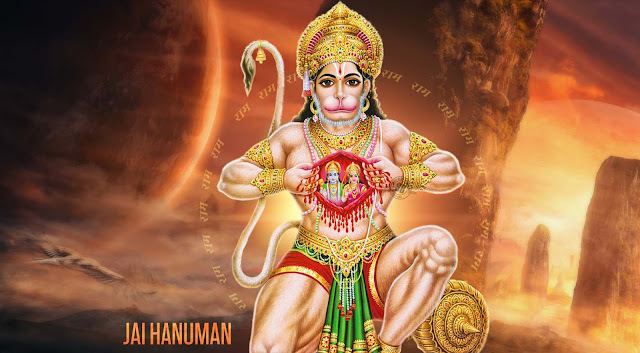 Lord Hanuman was called as Anjani Putra because his mother was Anjani. Hanuman was also known as Vayu Putra, the Vayu was wind God. Anjaneya was very hungry and mischievous also. Lord Anjaneya used to do pranks on so many sages while they were meditating. One day the sage felt very angry and cursed Maruti to forget all his mighty powers in his life. Most of his childhood, Anjaneya lived in Kishkindha. As per Valmiki Ramayana, Hanuman met first time Lord Rama in Kishkindha. At that time Lord Maruti was prime minister of Sugreeva, who was a king of Kishkindha. Hanuman and Sugreeva were good friends. Same time Lord Shri Rama, Lakshmana, and Sita were living in a forest. 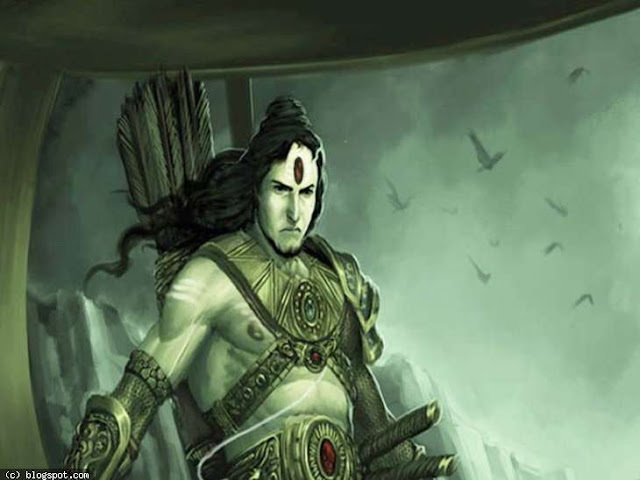 Lord Rama was living in the forest due to his father desire. One day demon Ravana took away Sita. Both Shri Rama and Lakshmana tried to find Sita Mata but they failed. While searching Sita, both Rama and Lakshmana came across Kishkindha. Maruti saw them and took them to Sugreeva. This was the first meeting between Lord Hanuman and Lord Rama. Very soon Hanuman became the greatest devotee of Shri Rama. When nobody was unable to cross the ocean to go to Lanka to find Sita Mata, One day Anjaneya dared to do that but he forgot all his powers due to the curse of the sage. Then Jambavantha reminded of Hanuman about his great powers then Hanuman became like a giant after he turned himself into the big shape and crossed the ocean very easily and found the Sita Mata in Ashoka Vanam. Maruti felt so angry by seeing the situation of Sita in Lanka. He wanted to destroy Lanka so he made so much of destruction. Asura Soldiers of Ravana caught up and picked him into the court of Ravana. In order to threaten Hanuman, soldiers burnt the tail of Lord Hanuman with fire. But using the same fire Hanuman burnt up so much of areas in Lanka. Ravana came to know about the power of Hanuman and that Hanuman is not a normal person by seeing all the destruction made by Hanuman. After burning Lanka with his burning tail, Anjaneya went into sea water to take a dip. At that time the one drop or precipitation of Lord Hanuman fell into the mouth one fish. Due to this drop, Hanuman got a son from the womb of that fish. Hanuman son name was Makardhwaja. Makardhwaja was almost the same as his father in bravery and courageousness. 1. You will be in the grace of Lord Hanuman. 2. Anjaneya will protect you from dangers and problems. 3. Your mind will be peaceful. 4. You will get more successes in your life. 5. You will get a good healthy life. 6. You will always be happy and wealthy. Om Aim Hreem Kleem Dinankampi Dharmatma Premabdhi Ramvallabha Adhaivam Marute Veer Me Bhshtdehi Satvaram Kleem Hreem Aim Om. Recite about Lord Hanuman mantra daily when whenever you want to worship Maruti. Yes Obviously my Lord Hanuman is still alive. That's why he is called as Chiranjeevi that means that person who has no death and always mortal. Maruti is one of those 8 Chiranjeevi who is still alive on earth to protect dharma and save good people from evil people. This all about the Hanuman stories and Hanuman Chalisa Benefits.